The heat provided by the Lucky Reptile sun spot lamp is more focused, meaning it does not scatter and increase the ambient vivarium temperature as much as some bulbs. This makes it easier to create a heat gradient, especially in smaller vivariums. The concentrated heat and light beam also means the lamp can be placed higher away from the animal without loss of benefits. 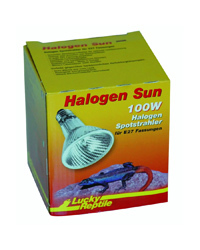 The Lucky Reptile Halogen Sun spot lamp brings more light and heat on the spot and does lead to a lesser increase of the ambient air temperature than regular reptile spot lamps with the same wattage. As result it is easier to set up the proper heat gradients in the terrarium and greater distances between animal and the spot lamp can be realized. Further advantages are the higher average life, the higher resistance against spray water and the 15% lower power consumption compared to incandescent spot lamps with the same wattage. A 75W Halogen Sun is suitable to replace a 100W incandescent spot in regards to heat output and offers even more light output.